Guess what? I am currently in Mexico, soaking sunshine in my bones and digging my toes in the sand. It’s awful…really! Seriously though, I’m taking a short vacation and will be back in a few days. When I return, I’ll give you guys all the juicy deets—promise! We’ve had this vacay planned for awhile and I found an ahhh-mazing deal for it online, which I’ll also explain soon. In my other life, I was totally a travel agent. 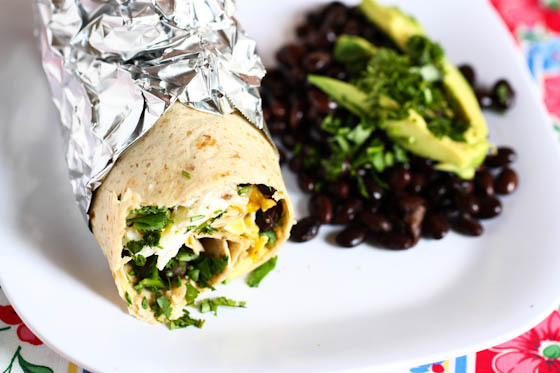 In the meantiiiiiiiiiiiiiime….how about a huevos rancheros wrap? And maybe a la paloma? It is Friday, after all. This is totally one of those “recipes” that isn’t really a recipe at all and to be totally honest, I feel a little silly even posting this when it’s just something I make for lunch for myself on pretty much a daily basis. Okay, maybe not daily basis…but definitely three-times-a-week-basis. Ever since my neighbor turned hair stylist (yes, you heard that right) gave me some farm fresh eggs, I’ve been a total egg monster. Scrambled eggs for breakfast, huevos rancheros wraps for lunch, omelets for dinner…I’m on a roll and cannot be stopped. If you have been reading this blog for more than three days, you know about my obsession with cilantro. I ADORE cilantro! But did you know that some people actually have a genetic aversion to it? To them, it tastes just like soap. My biggest issue with making these wraps is rolling them up after I’ve overstuffed them with eggs, beans, salsa and avocado. You’d have thought I would have learned my lesson by now, but I’m still rollin’. And rollin’…and rollin’…. But when you wrap it up tightly in tin foil, it becomes the perfect little portable meal to go! I love when things work out like that. I’m always trying to help our generation (I’m 25!) 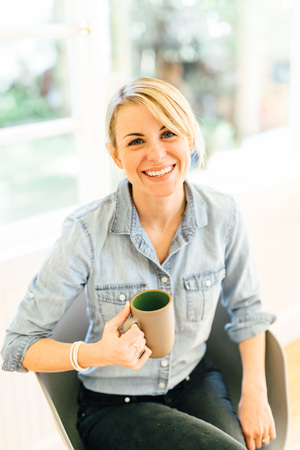 understand what a travel consultant can do nowadays! awesome! i just got back from Mexico a couple of weeks ago. I loved it!!!!! What part of Mexico are you visiting?? this wrap looks delicious…I’ll have to try it out! It looks amaazing. 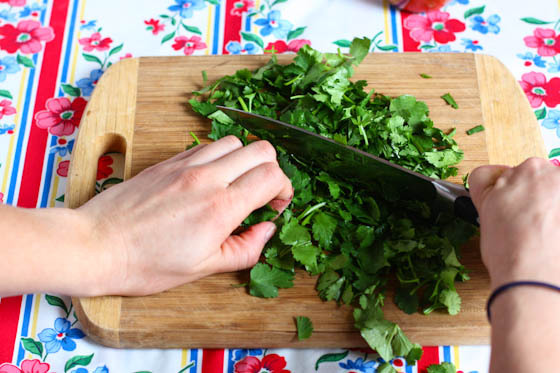 Cilantro is my favourite herb and I don’t know how I would cook so many of my favourite dishes without it! That looks delicious! I can’t wait to try it. I am a huge egg fan. I buy my eggs from SAMs in the 36 count. This looks like the perfect breakfast! I never understood how people did not like cilantro until I learned about the genetics too. I’m glad I don’t have that gene!!! Have fun in Mexico. Mmm tasty! Have a wonderful time in Mexico Jenna, and I can’t wait to hear about it!! If so, hope you brought Dexter along to serve as ring bearer. I’m crazy about farm fresh eggs, too! You’re wrap looks delicious- definitely something to add to my lunch repertoire. 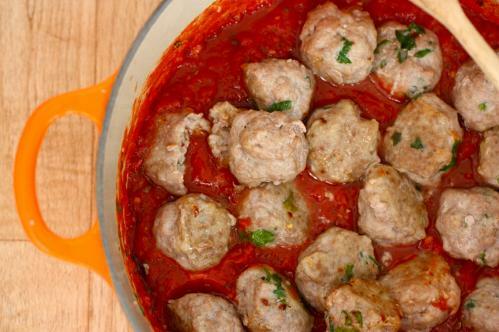 i love these kind of recipes, simple and delicious! Yummy!! 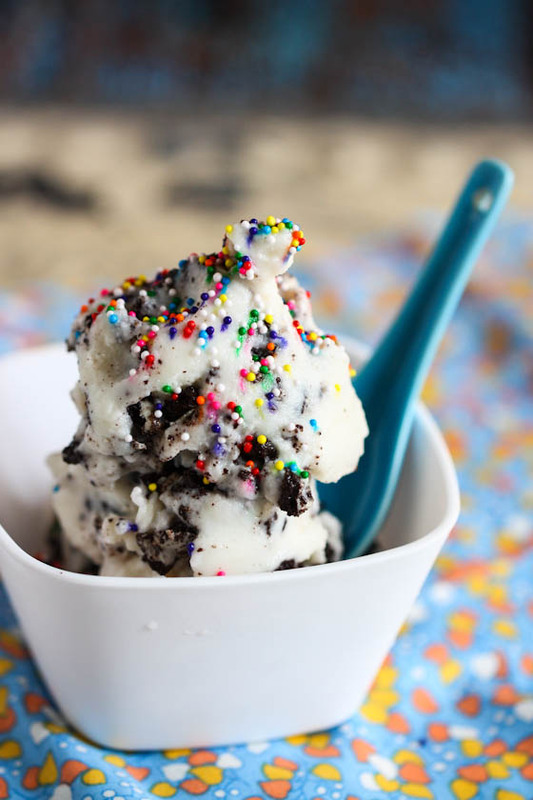 Definately making these this weekend. Have so much fun on your vacay… so jealous, you’ll be tan in March! I am so jealous!! I’ll just make this and pretend I’m there, a la It’s a Wonderful Life. mmmm sounds delish. I will have to make these soon! So glad I’m not one of the cilantro-avese – I love that stuff! And you are so right about farm fresh eggs being the absolute best thing ever. I’ve started craving them for every meal! Have fun in Mexico! Geez, when you live in California, isn’t the nice weather vacay enough? 😉 I’m just jealous! This belly filling deliciousness is perfect for a Saturday morning. PS I have a friend who can’t eat cilantro for that very reason. Feel so bad for him. I feel so sad for people who don’t like cilantro. They’re seriously missing out! I LOVE it, and pile it onto any Mexican dish I make. Exactly what I was going to say. Love cilantro!! Have fun in Mexico! 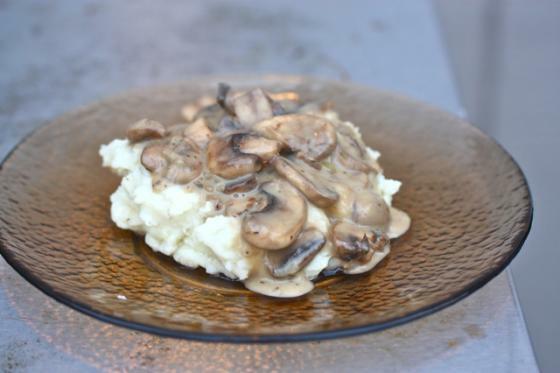 This looks too good to pass up-looks like a hearty, anytime meal! Enjoy Mexico ~ can’t wait to hear the juicy deets! My family jokes that I’m their travel agent since everyone is always asking me to plan their trips. Ha! Anyway this recipe is super timely. Just last weekend, my husband was begging me to make huevos rancheros. I never have and now I don’t have anymore excuses. Thanks!! This looks like a perfectly amazing breakfast. I cannot wait to try it. And, I cannot wait to hear about your Mexican vacation deal. I could use some sand in my toes. 🙂 Happy Friday! Ooh…..have a lovely rest of your holiday in Mexico, you lucky girl! I’m currently staring at a blanket of snow and not really liking what I see. LOL! 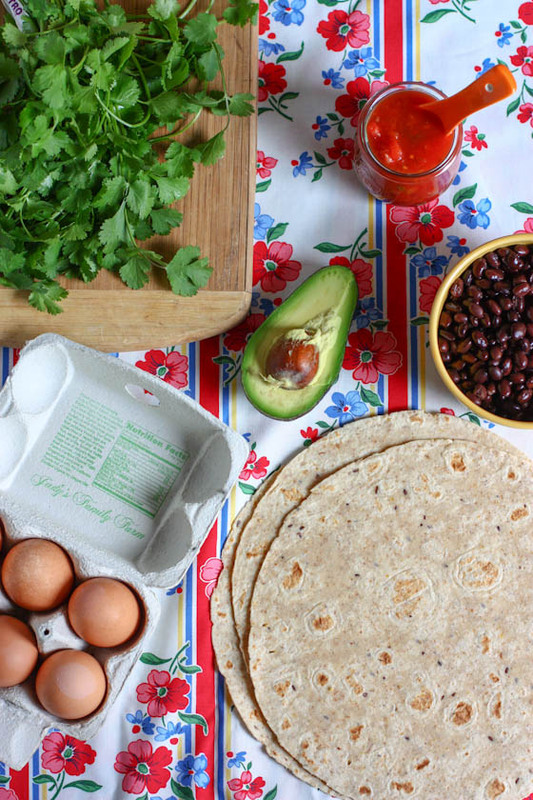 And as for these Huevos Rancheros Wraps…yay! I am a huge fan of eggs and find it oh so easy to prepare for myself. However, I tend to be pretty boring and just scramble up some eggs. Loving this equally simple, yet so much more interesting egg dish. Definitely going to try this one out! I love wraps. They are so versatile. And, I’m incredibly jealous. Have fun and travel safe. This wrap ain’t messing around! Yea, I’m one of those people who doesn’t like cilantro. I’ve tried. Boo. But other than that, the wraps look awesome! I’ve heard that about cilantro with some people. I have to say I am SO glad to not be one of them. I could eat that stuff straight from the ground in mouthfuls. Ok, maybe that’s a bit of an exaggeration but seriously, it makes everything so tasty! Enjoy Mexico, I’d kill for some sand + sun right now! I am totally making these sometime soon. It looks delicious!! I also adore cilantro. I used to work as a cashier and whenever anyone bought cilantro I would take a huge deep breath to take in the delicious scent. I would be so sad if cilantro tasted like soap. That is a really interesting fact about the cilantro! I really like it, but know many people who HATE it! 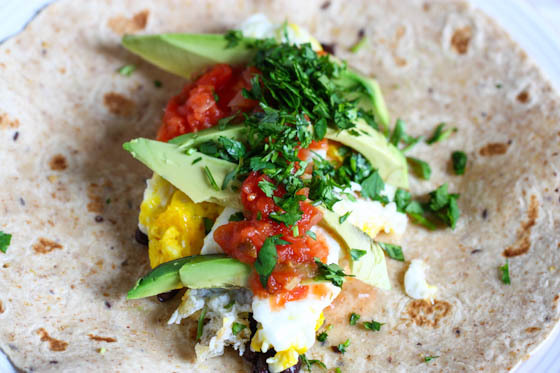 I love the combination of eggs and avocado (and tomato)- I should start bringing wraps like this for lunch! Have a great Vacay and come back all recharged ! 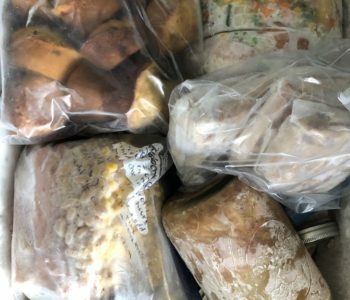 I pack a similar version for school lunch with my 7 yr old . Such a healthy and nutritious meal for active little ones! Yes, YES Please! Love meals exactly like this. This is what I order out usually. Have fun in Mexico, Jenna!!! You deserve it and glad you found a great deal on it, too. Enjoy your time down there! Oh how fun! I’ve never been to Mexico-I’d really be interested in all the details of your trip-hope you post lots of pictures! And I will def. 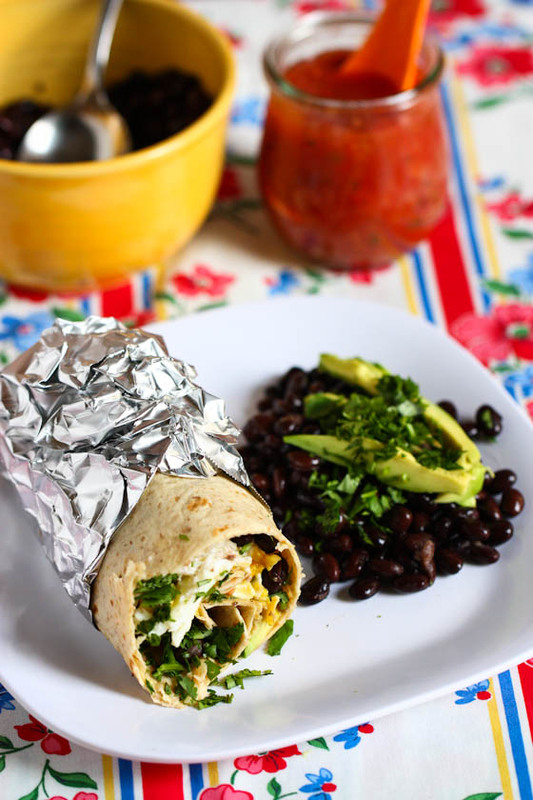 be making this wrap for breakfast tomorrow. With plenty of cilantro. Oh wow I despiiiiiise cilantro, it really tastes just like soap to me, blegh, aaand my mum and aunts are exactly the same!! I never knew it actually was a genetic thing?! I never understood how people even like it, let alone love it! Good to know! I love extended weekends in Mexico! And Mexican food… and the fact that this is a super easy little breakfast to make, wrap up and take to the beach here in SoCal. You know, for the weekends when hopping on a plane isn’t an option! I could eat eggs for every meal. And I am a chronic egg burrito over stuffer. Its a curse. This wrap looks delicious! I really need to branch out with my breakfast. I usually have oatmeal everyday! Huevos Rancheros are awesome! I love putting salsa on eggs so adding beans and cilantro makes it all better. A beach vacation in Mexico is necessary for March. Enjoy! So jealous – I could totally go for some tropical sun right now!! And these sound AMAZING!! Sounds amazing!!!! Live it up girl! Wraps are the greatest way to take your meal on the go! Ever since I tried those spinach wraps at Starbucks a few years ago, I tried my hand on one at home and they are my favorite thing to wrap in a warm tortilla. Have fun in MEXICO! Adios! I love cilantro … I can’t imagine having that aversion to it! And the wraps look delicious. I also have a difficult time wrapping my wraps. 😉 They always want to fall apart! Apparently the “genetic aversion” is a not yet proven theory. I think for some it is an acquired taste. I used to HATE it with a passion, and thought that it smelled and tasted like soap. Now… I’m obsessed, too, and can’t get enough of it. I don’t know how/when the change occurred, but it did. Anyway, oddly, I was just reading about huevos rancheros on a recipe website. I like this version! My stomach is growling just looking at these pictures. It’s breakfast time in Beijing…and I’m starving! We had guacomole today too! So delicious. And those doggies are adorable. OK it made not be a true recipe but I would love to have some one have it ready for me in the morning. Looks delicious. Being in New England the Huevos Rancheros are no where near where they need to be. That looks like home-made salsa! Would love a recipe for that too! And maybe a mango salsa…mmmm…. YUMMEE! I have a certain soft-spot for breakfast wraps. These look incredible. Gorgeous photography, as always. Thanks for sharing!